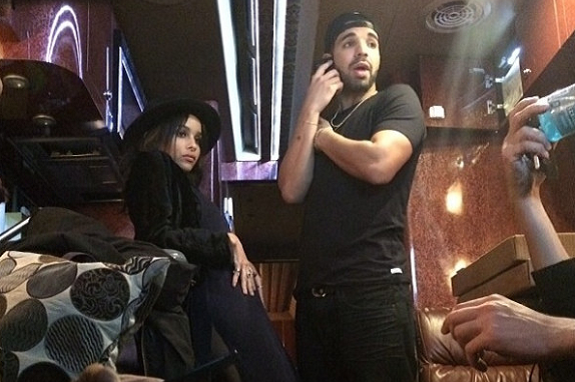 -Wait, Drake and Zoe Kravitz might be dating? But that breaks up two of my favourite fantasy couples in one fell swoop: Drake & Rihanna AND Zoe & Penn! -Sorry, but not even your secret BFF Jennifer Lawrence can make the sheer dress trend work. –Mindy Kaling wrote a very cute and encouraging letter to teen girls. -When I first watched the Kanye West video I thought “Finally! He’s learned how to poke a bit of fun at himself.” But the general consensus seems to be that this is a straight-up serious music video. If that’s the case, there aren’t enough eyerolls in the world (especially considering his recent performances of that song have been amazing). -Who has more self control: Rob Ford or Alec Baldwin? -Oh, and now Alec Baldwin is hate-Tweeting at Anderson Cooper. Classy. –Variety’s feature on Emma Thompson makes me love her even more, and I didn’t think that was physically possible. -God bless Jezebel for scouring Reddit to find the best stories from groupies. -Although I still can’t quite believe that Armani managed to confuse Alfre Woodard with Idris Elba, it did spawn a very funny meme. -It sounds like Frank Darabont still isn’t over getting fired from The Walking Dead. –Jennie Garth has split from the guy you didn’t know she was dating. –Evan Rachel Wood has no interest in telling you her son’s name so just stop asking, ‘k? –Kate Middleton says Prince George is “growing very fast,” which is exactly what all new mothers say. Do you think she also spams all of her friends’ Facebook feeds with baby photos? –Early reviews of Catching Fire are strong. Yay! -Wait, so Kristen Stewart’s hideous tattoo isn’t just fake ink for an upcoming role? Uh oh. –Chiwetel Ejiofor and Kate Moss‘s photo spread in Vogue is gorg! -Betrayal has basically been cancelled by ABC, and I’d be surprised if Once Upon a Time in Wonderland comes back, either. -Planning on attending Arcade Fire‘s upcoming tour? They want you to dress up like a fancy pants. -Just in case you were wondering, Roseanne Barr is still utterly insane. -This is disappointing: Daniel Day-Lewis‘ son appears to be a homophobic jerk who thinks he can rap. -These Orphan Black credits in the style of Parks and Recreation made my entire day. –Franz Ferdinand has a new video out. I missed these guys! -Speaking of new videos, let Sarah Silverman teach you about divas. -Awww, crap. I want to give Chris Hardwick a hug now.